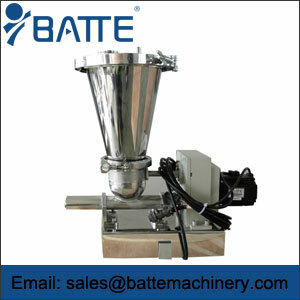 The following points from Batte Company provide a detailed consideration relating to the design of Metering Screw Feeders used in controlling the flow of powders into a process at a prescribed rate. This perspective is based on the experience from Batte Industries a leading China company, synonymous with metering and loss in weight feeders. Whatever means are employed to actually control the powder, certain basic fundamentals need to be assessed and understood before a solution can be arrived at. Diameter of Screw – This is the nominal outside diameter of the screw not the diameter of the tube in which it runs, nominal, because a 40 mm screw is in fact 38 mm diameter. ; a 20 mm screw is 19 mm diameter etc. These differences only occur because the nearest available stainless steel tube schedule requires selection of these dimensions to give a proper running clearance. Pitch of Screw – The dimension from leading face to the next leading face of the screw. In metering screw feeder terms the pitch dimension relates to the nominal screw diameter, applicable on screws up to 100 mm diameter. Above this size, the pitch will be smaller than the diameter but is still referred to as full pitch. Box Loading – This refers to the level of material in the screw tube/casing and is usually quoted in % terms i.e. 50% etc. When box loading is related to the screw pitch then fractional terminology i.e.1/2, 1/3 is invariably used. For reference, Rospen apply 100% loading. However, for long feed applications the screw may require an expanding pitch to reduce the box loading in the tube. Volumetric Feeding – Strictly based on a screw of a known diameter and pitch, metering powder at a specified speed. It must be noted that that any variation of material bulk density will have a direct effect on the ultimate feed rate. Metering Screw Feeders are our hot products, and Batte also manufactured melt gear pumps and screen changers. Any details about these products, please send email to us freely.